Jesus compares the rulers of the people with virgins. The person who discharges a sacred function must be undefiled in soul and body, just as Paul says, ‘that she might be devoted to the Lord in both body and spirit.’ For it is customary for the Scripture to divide the present age into five seasons or times. It assigns to each time both God-fearing and foolish souls, just as each time has wise persons and simpletons, righteous persons and wicked ones. In the parable, all the virgins go out with their lamps. Jesus indicates by this that all souls have been illuminated by God through innate and natural laws but also indeed by the laws written by Moses. Now all the virgins went out to meet the groom. All were determined to seek favor with God and to join themselves spiritually to the groom. He sows in the hearts of the faithful the seed of every kind of virtue. Indeed, this is why He is called a groom! Nevertheless, some prove to be undistinguished, though they possess an illumination from God. He mockingly calls their drowsiness the death of the flesh, which by necessity will go before both wise and foolish, whom the trumpet of the angels awakes at the time of Christ’s second coming. For all who have been rendered powerless by death are awakened, the good and the bad, and all are made ready to present their defense before the judge. 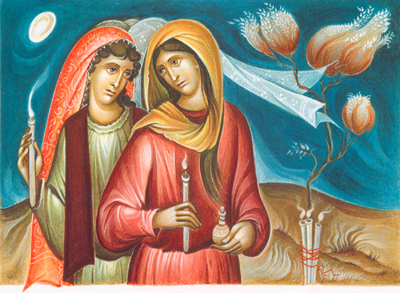 This is represented in the parable when each virgin trims her lamp, summing up all that has occurred in her life. The thoughtless virgins have brought no oil with them. Their soul begins to grow gloomy and as if snuffed out departs into a hallucinating state, so as to think they will be shown mercy through the virtue of the others. They are rejected as the other virgins say there is not enough for us and for you. The virtue of each scarcely suffices for the salvation of the soul, because even those who are very wise transgress in many ways.